On another note, have any of you readers seen the movie Ratatouille? It's a Disney children s movie that came out in 2007. Well, I had never seen the movie because I'm deathly afraid of rodents. I think they're disgusting and even the thought of a mouse or rat makes me lose my appetite. Well, Daryl was looking for a movie for us to watch the other night and convinced me to watch it. I told him I was going to have nightmares that night even though it is animated and cartoon rodents seem really clean and not disgusting. I had the craziest nightmare that night where the world was taken over by rats. Not just ordinary rats but ones that were the size of large dogs! I had a sword in my dream and I had to slice these rodents to pieces and it was a really bloody/disgusting/terrifying nightmare! I woke up (thank goodness I have to take at least 2 bathroom breaks every night) with a cold sweat and scared to go back to sleep.. the end. Happy Thursday friends! Now, I have been keeping an eye out re maternity stuff... and I saw a tutorial I really loved here. There are also some cute things on ASOS. The colors of your dress are just lovely. I love your baby stories on your post. My son does the same way. He will wake me up at around 2 am and starts moving. That I think is the part of pregnancy that I miss the most, knowing that something so precious is growing inside of you. i love the colours of your dress! Blech what a gross nightmare!!! Hate that! You look so gorgeous with your preggo belly but ya it can get annoying towards the end, having nothing to wear or just always wearing the same thing! The last few weeks I just hung out in activewear, you know, the fancy way of saying sweats and Tshirts:) All the best! You are so pretty! I love this dress on you, fun colors! You still looks wonderful and pretty <3 Love the dress and good luck with your baby! You look adorable. I love your outfit...That dress is so pretty! 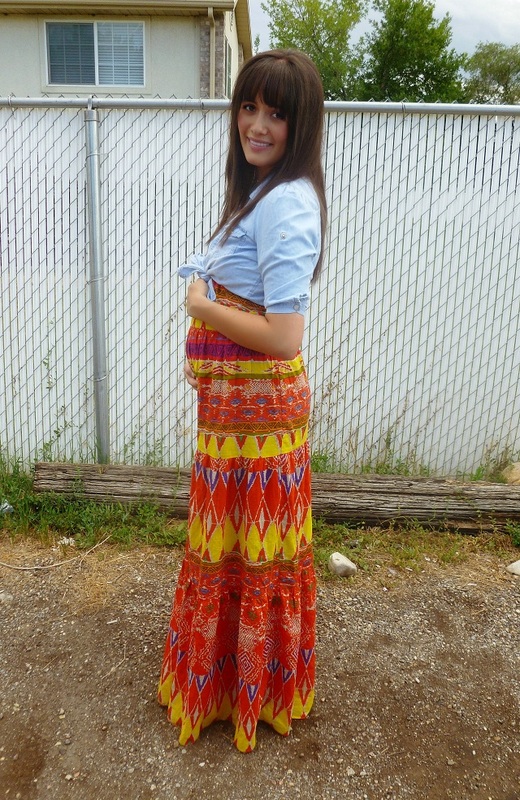 Maybe you can find long skirts to wear just above your baby bump with fitted tees, tucked in (similar to the june 25 post)? Sorry about your rodent nightmare...that sounds terrifying! You still look adorable! :] And that nightmare does not sound like fun! I'm sure it was even more vivid and scary because you are pregnant! Haha. And I got maternity clothes from Target and Motherhood Maternity. Kohls has a few good things as well. Oh, and Shade Maternity had some super cute and comfy pants but I had to hem them and bring them in some to make them what I wanted. I hope all that helps! What a cute dress (and an even cuter baby bump!) Just found your blog on Aunie Sauce and love it! JUST GO TO THE THRIFT STORE AND BUY BIGGER SIZES YOU DOOF! Sorry for your nightmare...I absolutely loved Ratatouille and wish you could have enjoyed it too. This dress is incredible, btw...I love the vibrant colours and swishy fabric. To cute! I love how colorful your dress is! Oh you look darling! That dress looks so comfy. What a beautiful maxi dress; love the way you styled it with a denim shirt. Funny Rat story; I actually enjoyed the movie when I saw it. great outfit again. you look stunning! your bangs are amazing here! You look gorgeous and the baby bump is probably the cutest I've seen. Wow! I would hate to have a dream like that! I love the movie Ratatouille ,always been inspired by the dishes made on their. I wish I could help you out with the clothing issue but I'm just a student lol Hope you find more clothing! Cute dress btw! Omg Ratatouille is the Hubby and I's favorite! So cute, but your dream sounds horrible! My hubbys name is Darrell too :) H&M always has the cutest clothes that are really cheap! And you dont have to only wear their maternity clothes, as alot of their shirt/dresses are stretchy body con material! lol although I'm scared to death of mice and rats, I actually loved Ratatouille and thought it was such a cute movie. You look SO beautiful! You are so tiny with just baby belly! Lucky girl :) Love that dress too! yes, its so frustrating not being able to zip things up. The first thing to go out of my closet were the zippered skirts. I don't know how many times I wear an outfit and say "well this will be the last day I wear this!" I have relied on maxi dresses without waist bands, and stretchy skirts, and leggings with long shirts. Have you been to citycreek? The store love culture has a lot of maxi dresses that look cute with cardigans over. stretchy skirts I have found at Bohme Boutique and at Forever 21. leggings and long shirts from H&M and Forever 21. they both sell long shirts, that I think are actually dresses, but on us pregnant bellies they are more like long, slim fitting t-shirts. They're usually around $8-$15 and the leggings are like 5 bucks at F21. Also, I know you know about ASOS, but I think their maternity clothes are AMAZING. Luckily you are still small enough that a lot of your skirts can go up and up and up while your belly grows! I'm at the point where I've almost completely lost my waist! You are such a doll! Thank you for swapping ads with me. I was so stoked when I found your ad request waiting because I have actually visited your site several times before! Love it here. Cute dress! Your nightmare sounds terrifying. I'm afraid of rodents as well and I can't imagine anything worse than rats the size of dogs. Love your blog! You look a lot like Rose Byrne! 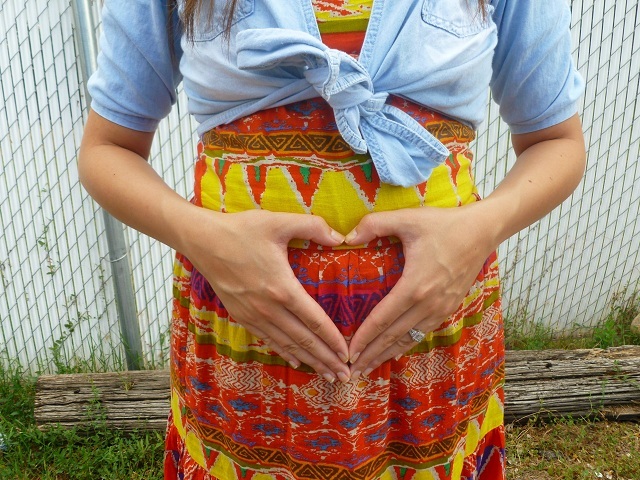 pregnacy looks beautiful on you!